Excavated 1928, 1930 and 1932. Click on one of the four areas of the house on the pompeiiinpictures plan above to see the pictures of that part of I.10.4 House of Menander. You can also click on one of the hyperlinks below to see the pictures. 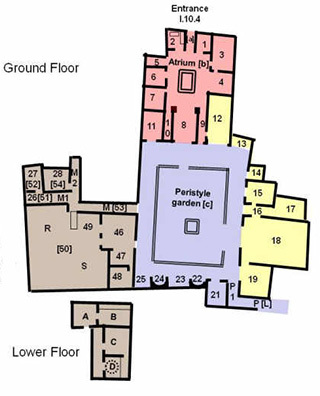 Rooms 21 to 25, P, P1 and Peristyle garden. Rooms 26 to 29, M, M1, M2, 46 to 49, R, S  and on the lower floor A, B, C, D.
The kitchen garden was numbered 50 by Maiuri (1933), but divided into two separate areas, R and S, by Ling (1997). We have included reference to both numbers in the form R and S for maximum flexibility with other sources. This also applies to a few other rooms. Pompeian Households: An on-line companion by Penelope M. Allison (2004). See http://www.stoa.org/projects/ph/house?id=9 . Where the pompeiiinpictures plan has two numbers for a room, the numbers in [ ] are those on the on-line companion site. The Insula of the Menander at Pompeii VOL. III: The Finds in Context: An on-line companion by Penelope M. Allison (2006). See http://www.le.ac.uk/archaeology/menander/index.html . Where the pompeiiinpictures plan has two numbers for a room, the room numbers NOT in [ ] are those on the Finds in Context site.